Who, what, when, where, why, W. The first five are the words of inquiry we learnt in primary school. They help us find answers and make us think through sequences of events. W, on the other hand, may just be a letter but it sums up everything from the who to the why. A red carpet and a long flight of steps await your arrival once you enter the main doors. Changing purple lights shine through a waterfall. The lobby greets you once you mount the flight of steps. Check in time is at 3pm (check out is at noon), and since we arrived early, we had to wait for our room to be ready. We explored the area and even ventured into the main island but I don’t encourage this because all we did was spend hours waiting (unless you’re game for the beach and in which case, may I recommend Tanjong Beach Club). Waiting for the Play Rider; looking for the beach tram (which was coincidentally not in operation that day); waiting for shuttle buses; and going to the S.E.A. Aquarium and finding out we had to queue for 3 hours just to get in. Time is money and those who did queue up to get in must have had too much spare cash. We didn’t want to waste our time doing nothing, and so we made our way back to the hotel. Near our hotel, taking a break from travelling fruitlessly around Sentosa. Because it was after 3pm – almost evening time, actually – we checked in and finally got to see our room! Really comfy king bed! The bathroom connects to the main area but the frosted windows can be closed. Minimalist bedside table with a twist. Very random tuft of feathers. On the other side of the room. I closed the curtains so you can see the colours of the lamp. A glimpse into the bathroom, which has a bathtub and a rain shower! What’s on the bathroom counter. Really thoughtful things like toothbrushes, toothpaste, water, sewing kit, soap bar, facial tissue etc. Who in the world goes to a hotel and stays in all the time, right? We immediately made our way to the pool just right beside the harbour where all the yachts are docked. I loved the pool immensely because all around it was so peaceful and there was just so much sky to look at. No traffic screeching, honking or revving in the distant, no inter-human shouting. Just pure delight! Tell me, what does this candy represent? As the sun set, our spirits rose. Seats around the pool bar! They only light up at night. The pool bar and the Lighthouse Deck. Atop the Lighthouse Deck above the pool bar. I guess you could say my favourite part of the hotel is the pool! The hotel also has a bar, named Woobar, where we were offered a complimentary drink each upon check in. I ordered a Singapore Sling while Mr. Ratatouille got a Tequila Sunrise – both obviously bar staples, but these were strong and of generous portions. I advise against in-room dining, unless you’re willing to fork out S$45 for a bowl of laksa. Dinner for us, instead, was a gnocchi with gorgonzola sauce and a feta cheese and spinach ravioli at an Italian restaurant, Solepomodoro Trattoria – Pizzeria, along Quayside Isle. I highly recommend this if you’re in for tasty, authentic Italian food! Breakfast at the hotel is pretty good too, with a wide variety of options. Milk and juices come in individual glass bottles, while coffee and tea can be ordered via the waiters and waitresses. Do try the waffles, croissants and porridge! Just a sneak peek at morning food! We booked a spa appointment on our second day at the hotel’s Away Spa. If you love spas, you’ll love this one. It’s got a heated jacuzzi inside, as well as a whole lot of other rain showers and facilities. It’s absolutely clean, quiet and you do get some time to yourself before you emerge refreshed and relaxed. I tried out the Scent Balance, which almost put me to sleep (I wish it lasted twice as long), and recommend it if you’re new to spas. The little sitting area outside the spa. Check out the lights in the room. They can be changed (manually) according to your mood. 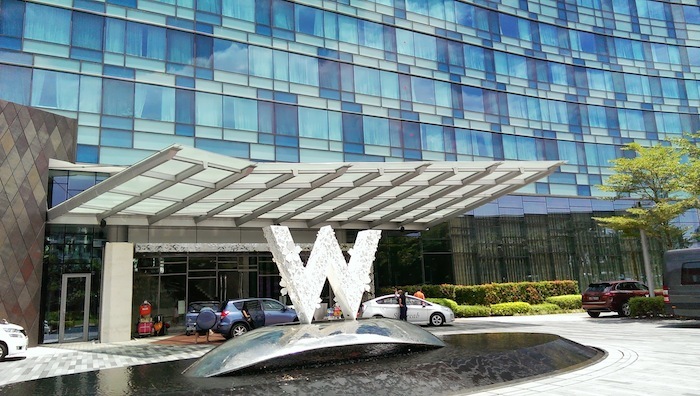 Staycation: W Hotel Sentosa Cove was last modified: August 18th, 2013 by Roxanne C.
London Diaries – I Will be Back!